Translation: Yuki Mine the designer’s flight to be grounded. Even so, the Armani Hotel – located in the world’s tallest tower – has already taken off in popularity among the Dubai elite. 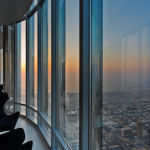 From the base of the Burj Khalifa, in downtown Dubai, to the 16th floor, the hotel offers unparalleled luxury. 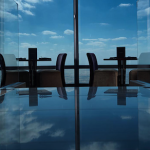 The 38th and 39th floors are penthouses for celebrity guests and their like. Starting from a mere US$2,400 per night, a suite at the Armani Hotel offers not only the signature luxury of the brand, but also majestic views of the whole of Dubai – from the sea to one side, to the desert to the other. 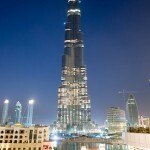 In addition, it also offers the best view in town of the world’s tallest dancing fountain show outside the Dubai Mall. 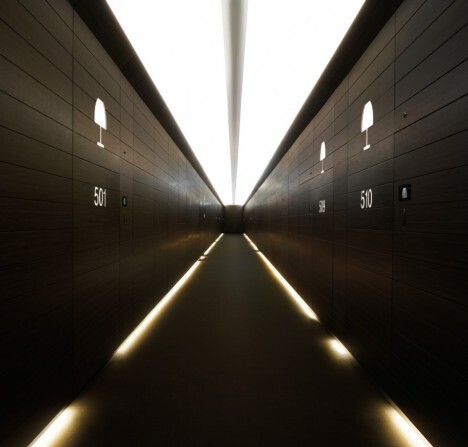 The interior design in the hotel’s 160 rooms and 144 private residences, down to the hand towels in the bathrooms, are chosen by Armani to reflect the style of the brand. Even the toilet hoses look too elegant to be actually used. The finishings in the rooms are selected from all around the world, such as handmade leather from Florence for the walls, bamboo marble from Brazil, and tatami from Japan. 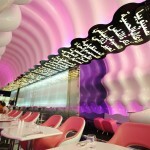 The service also matches the hotel’s sophisticated design. A personal lifestyle manager will ask each guest on their interests and desires during their stay. By “carefully selected personnel”, all “needs are attended to in a discreet manner” the hotel management have made a point of saying. Among hotel’s eight choices of restaurants, Ristorante stands on the top of our recommendation. The Michelin starred chief chef can offer tailor-made seven course meal.